The manager of a Seattle Sears store was surprised by the contents of an envelope that was delivered by an old man to his store this week. Inside the envelope was a crisp $100 bill and a letter of apology. 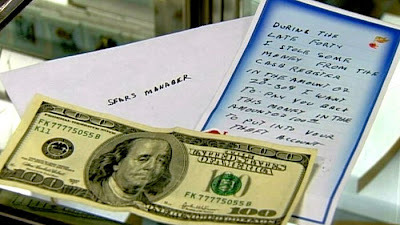 The letter explained that the elderly gentleman had stolen money from a register at the store more than a couple of decades ago. The $100 covers the $20-30 that was stolen in the post war 1940's plus interest. It appears that the old guy cleared his conscience cheaply, since according to the inflation calculator at dollartimes.com a $20 bill in 1948 has the equivalent value today of $187.33, almost twice the amount returned by the crook. A spokesman told us that they have the security footage, but as yet have not decided whether to pursue the thief for the rest of the money that he owes. San Fransisco law now bans the incentivizing of 'unhealthy' fast food meals by offering a free toy with the purchase. 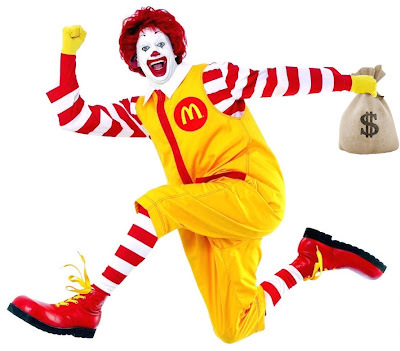 The so-called 'Happy Meal Law' went into effect on Thursday and McDonald's have already loopholed their way around it. The law does nothing to prevent the sale of a toy to accompany the meal. McDonald's announced that for an extra 10 cents they will add a toy to the happy meal bag. We challenged McDonald's about the 10c McToy surcharge, and how it would add to their profits. They told us that each and every dime from the sales of the toys will be donated to the Ronald McDonald House charity. Lady Gaga joined Sugarland to close out the Grammy Nomination show this week. She added her voice, piano and wacky make-up to the country duo of Nettles and Bush to sing 'You And I'. A crematorium in Durham, England has added turbines to the oven exhaust in order to generate electricity, with the aim of selling the power it creates and pumping into the National Grid. A scientist calculated that in order to generate sufficient power to make the scenario cost effective, the cremation oven would need to run 24 hours per day, and at the current death rate, there are insufficient dead people to meet those figures. Even by adding a pet cremation service, the ovens would only be running for a maximum of 8 hours per day and then only for 5 days of the week. Undetered by the challenges, Durham Crematorium have undertaken a partnership with a local Pizza Hut in order to keep the ovens running 24/7, by cooking pizzas between cremations. 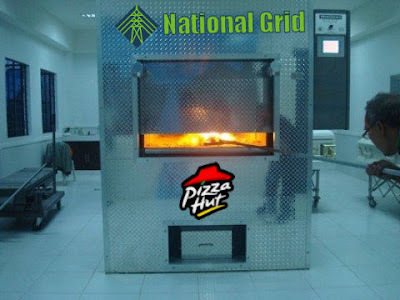 There is even talk of offering a catered cremation combo where you can burn one body and get a free pizza with a coupon. Extra crispy anyone? Hahaha.. thanks for the smiles this morning. Gotta say.. those McDonald's ceo's etc sure know how to work it. I would have never thought of an idea like that. Great post.. Thanks again!